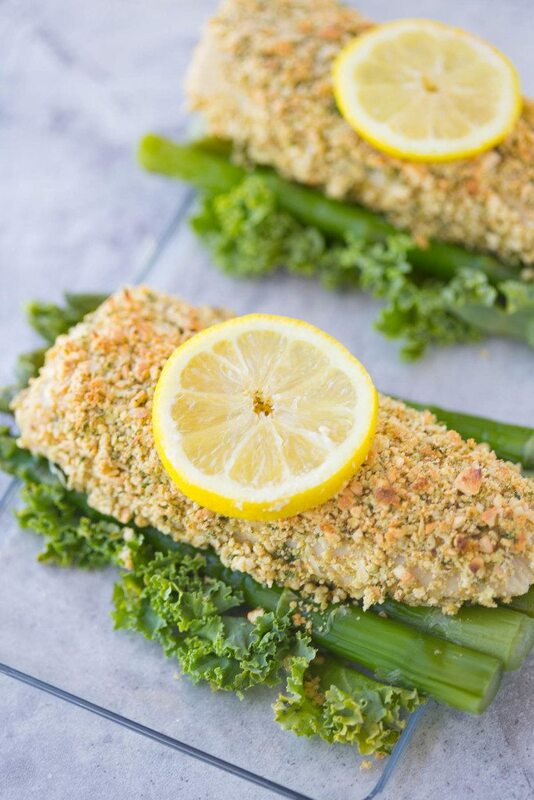 Coconut-Cashew Crusted Mahi-Mahi is a quick, easy, and healthy dinner option that’s ready in under 20 minutes! Serve it up with a side of fresh grilled asparagus and caramelized pineapple, and you’ll feel like you were whisked away to the tropics. And I am unconditionally and irrevocably in love with you. The fact is I always have been. I just kinda-sorta-a-little-bit forgot about you. Growing up on the coast, eating fish once or twice a week was completely normal for my family. My dad used to charter deep sea fishing boats and would come home with pounds upon pounds of fresh shrimp, king mackerel, wahoo, tuna, and dolphin. Wait, wait, wait…before y’all go freaking out on me here, when I say dolphin I am not talking about Flipper! Dolphin is what we Charlestonians call mahi-mahi. It wasn’t until I started receiving horrified looks from people from off that I realized mahi-mahi was a much more socially acceptable way to identify my second favorite kind of fish to eat (wahoo can never be beat). Our freezer used to be chocked full of freshly frozen seafood, and it was wonderful to have on hand, especially in the summer, because it defrosts quickly, it marinates in a matter of minutes, and it cooks even faster. Since moving to North Carolina I’ve gotten out of the habit of eating seafood on a weekly basis because it’s not as easily accessible as it is at home plus my in-laws aren’t the biggest fans so fish has fallen out of the rotation. After creating this coconut-cashew crusted mahi-mahi, however, my seafood eating days are back on track. My husband has specifically requested this dish at least ten times since I first made it last week and, since our son can’t seem to stop stealing the fillets as soon as they hit my plate, it is now a necessity that I oblige. 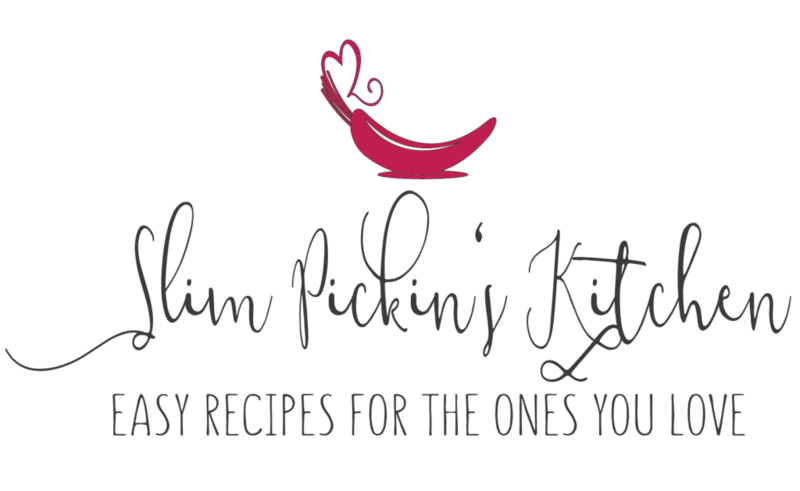 The technique used for this recipe can be used for any kind of fish fillets you prefer or have on hand. Baking the mahi-mahi for 5 minutes releases its natural juices making it a cinch to adhere the crust to the fish without any additional egg, milk, or liquid binder. The remaining cooking time toasts the coconut and cashews giving the dish a pop of nutty flavor and a touch of tropical pizazz. 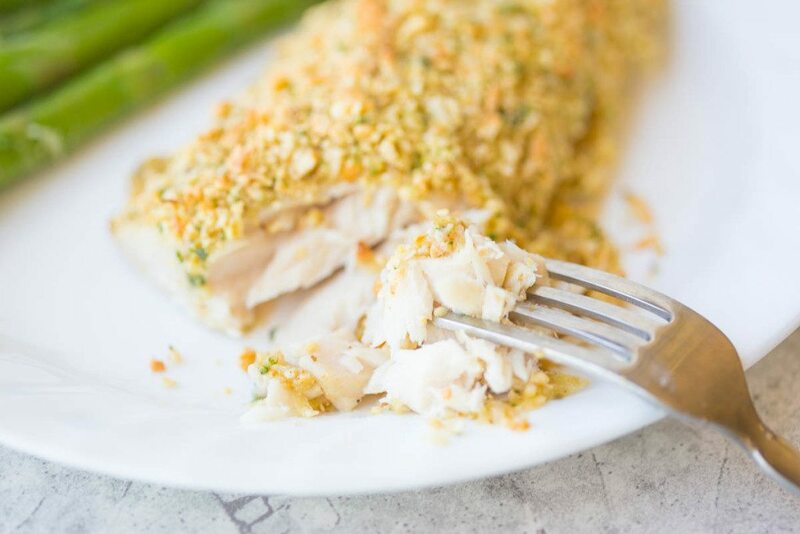 Coconut Cashew Crusted Mahi-mahi is elegant and easy enough to whip up for a full-blown dinner party or to make as a quick supper on a lazy Sunday afternoon. Serve it alongside some freshly grilled veggies and a crisp Sauvignon Blanc, and you’ll begin to wish that summer will never end. 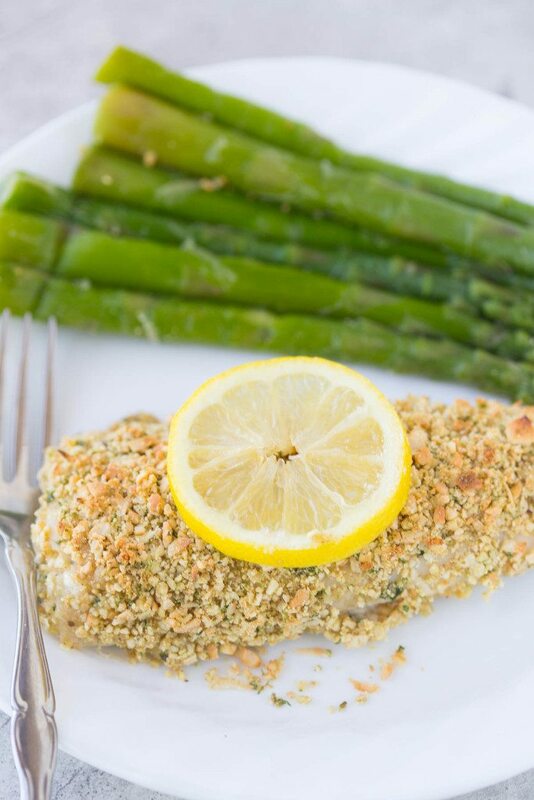 Coconut Cashew Crusted Mahi Mahi is a quick, easy, and healthy dinner option that's ready in under 20 minutes! Serve it up with a side of fresh grilled asparagus and caramelized pineapple, and you'll feel like you were whisked away to the tropics. Preheat oven to 425 degrees (F), line a small baking pan w/ tin foil. Brush the lined baking pan and the top of the mahi-mahi fillets w/ the coconut oil, sprinkle the fish with salt & pepper, then bake for 5 minutes. 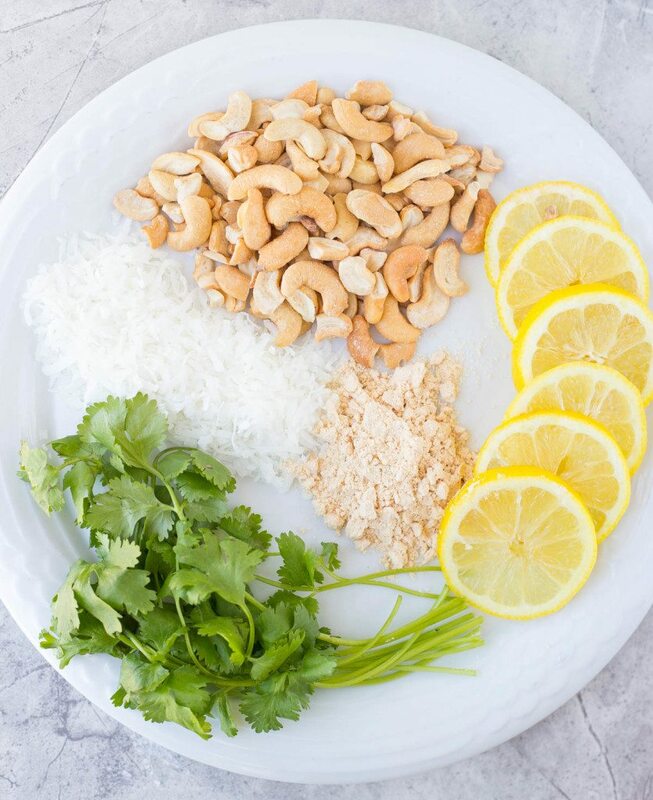 While fish is baking, combine cashews, coconut, seafood seasoning, garlic clove, coconut flour, and cilantro in a small food processor or personal blender and pulse until coarse crumbs are formed. Pour crumbs onto a small plate. Remove the mahi-mahi from the oven then gently press all sides of the fillets into the coconut-cashew mixture. 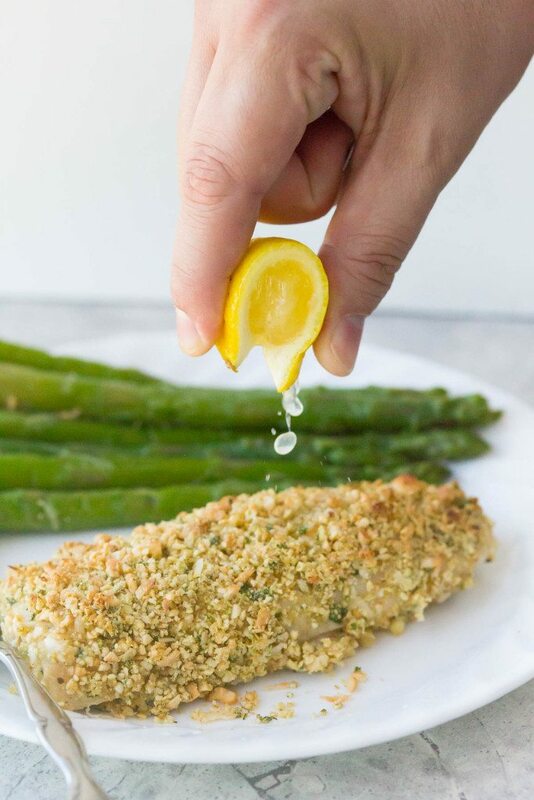 Add any remaining crumbs to the top of the fish (it's too good to waste!) then continue to bake for 8-10 minutes or until fish is cooked through. Serve immediately with a squeeze of fresh lemon and a side of freshly grilled veggies and caramelized pineapple. I loveee mahi mahi! I can’t wait to try this recipe! This one is soooooooooooooooo good too! Thanks, Tracy! Love that lemon shot! Never tried cooking mahi-mahi but this looks so good I’ll have to give it a try! Thanks, Michelle! This is a crazy easy recipe so let me know if you give it a shot! You had me at “coconut.” This sounds great! I’m a huge fish lover too, having also grown up on the coast. I’ll have to try it the next time halibut is on sale! OMG! Send me some halibut when it’s on sale!!!! It’s my 2nd favorite fish EV-ER. Do it! It really makes a difference and helps the nuts stick without any specific binder. This looks absolutely delicious! I love Mahi Mahi, but I also agree with you …Wahoo is the BEST! Can’t wait to try this! Wahoo is the best! I had some the other day with a sweet corn sauce and garlic mash. OMG, it was pure heaven! This both looks and sounds wonderful! 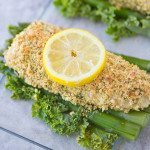 I’ve been looking for a great breaded fish to try! I love how you’ve incorporated the cashews into the crusty outside! Brilliant!! Ooh I love encrusting my chicken with coconut but didn’t think about doing it with fish! My entire house filled with smoke. Turns out Coconut oil has a smoke point of 350. How did you cook this at 425 without your house looking like it was on fire? Chris, really?!? I’m so sorry! I haven’t had this issue at all, and I cook this recipe all the time. Did you cook it on a cookie sheet lined w/ the foil and brush the oil on? We made this recipe tonight and it was fantastic! We served it with Jasmine rice and edamame pods. This meal is definitely going into rotation over here! Yaaaaaay!!! So happy you liked it! Also, so sorry I’m just getting back to you! 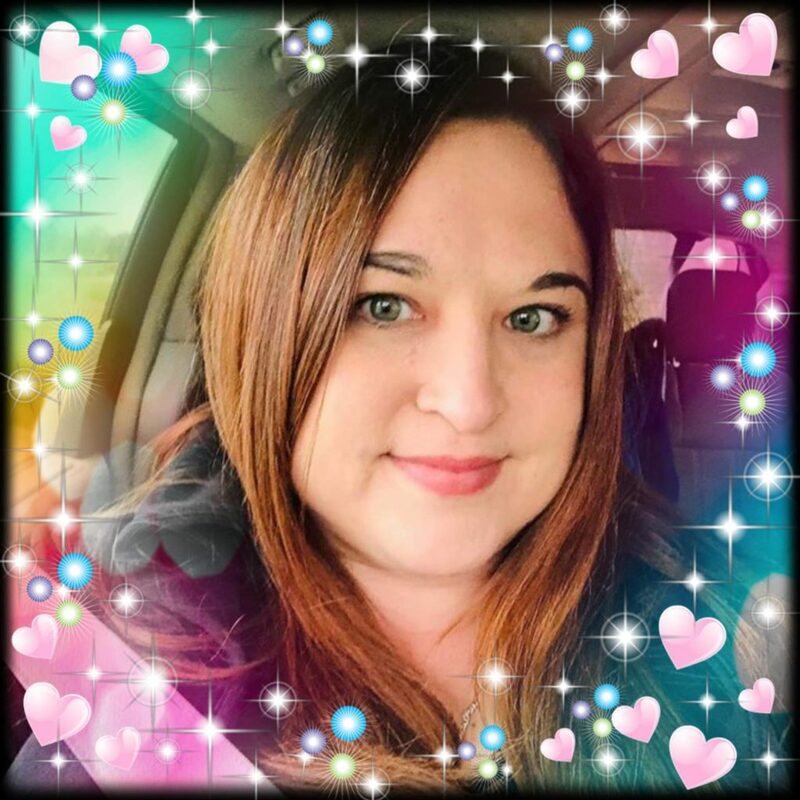 I’ve sort of taken a break from blogging, but I’m getting back in the game! Thanks so much for commenting!